In the mood for a pre-packaged healthy snack? Or how about a slice of quick bread to accompany a cup of tea? Look no further than the ubiquitous banana. All zipped up in its own skin (which doubles as a nifty handle) the banana is transportable as a nutritious snack on the go – naturally sweet and rich in potassium, magnesium, B and C vitamins. As bananas ripen, they soften and their sugar content and starch increases. At this point, blend the fruit into a wholesome sweet bread or cake – or pop them un-peeled into the freezer to save for the proverbial rainy day when baking is requisite. I prefer to eat bananas just under-ripe, while they are still firm and not overwhelmingly sweet. When they reach the mushy tipping point I toss them into a banana bread. While the ratios for my banana bread remain the same, I sometimes fiddle with the ingredients. This is a heartier recipe with a blend of whole wheat, all-purpose flour and a dusting of wheat germ. Coconut flakes add texture and a tropical brightness. If I were feeling naughtier, I would have added chocolate chunks, but somehow I managed to behave myself. How do you prefer your bananas? Preheat oven to 350 F. (180 C.) Butter a loaf pan, line with parchment, and butter the parchment. Mix the bananas and sugar in a bowl of an electric mixer until smooth. Mix in the eggs until blended, and then mix in the oil, vanilla, and cinnamon until just combined. Whisk the flours, baking powder, baking soda and salt in a separate bowl. Add to the mixing bowl and mix on low speed until just combined. Stir in the coconut. Pour the batter into the prepared pan and spread evenly. Sprinkle additional coconut on the top. Bake until a knife inserted in the center comes clean, about 55 minutes. If the cake is golden brown on top and still not entirely cooked, loosely cover with foil and continue to bake, checking every 10 minutes until done. Remove from the oven and cool on a rack for 10 minutes and then remove the bread from loaf pan and cool completely. A MUST make for my husband- this loaf looks so beautiful with all the tropical flavors – YUM! I love this … quick and easy. My dear friend has several banana trees in her backyard which are all ripe at once. yikes. I’ll give her this recipe… I love the coconut! I love coconut in many incarnations and this bread looks great! Our bananas are very expensive at the moment ($15 a kilo) after the hurricanes in December so I buy mine on special, slightly overripe, peel and slice them and then freeze to use in milk, cocoa and banana smoothies or “instant 3 ingredient ice-cream“. I always have a few frozen over-ripe bananas in the freezer, and never think about a banana bread. Love the idea of adding coconut. Banana and coconut, love that combination. Gives me a little smell/sense of summer and that’s what I need in this season! Love that combination, looks very delicious. We made a version of this a while back. Great stuff! 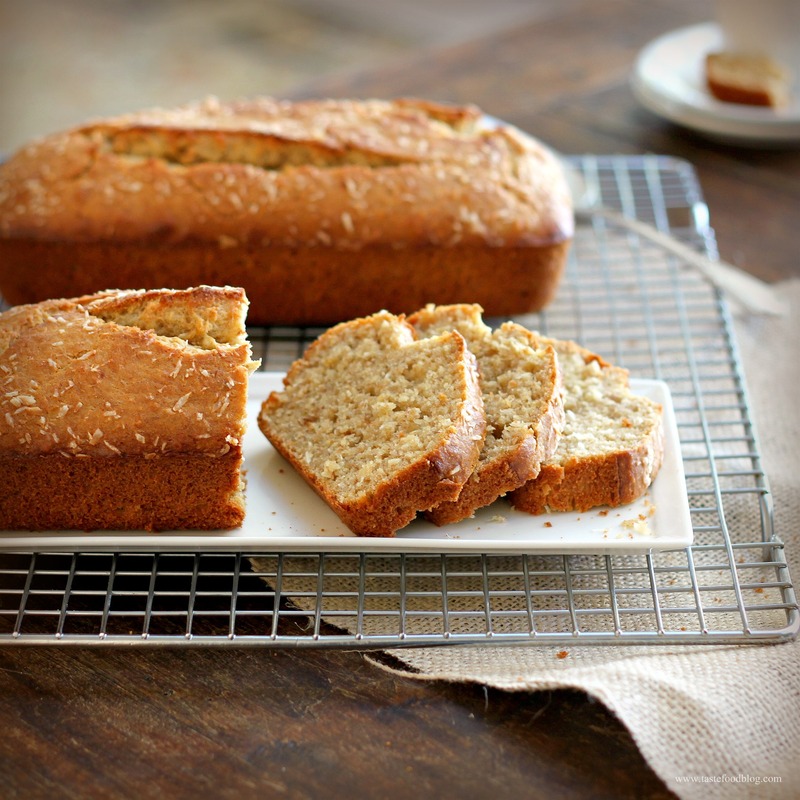 I love banana bread and make it often at home but I have never tried it with coconut. Will try it soon. By the way very nice pic. I love banana bread and make it often but never thought to add coconut! Looks amazing. Am also loving the healthy wheat germ kick. This looks so good Lynda. I love bananas and I love coconut, so I imagine I’d adore this! Great minds think alike — I just made something really similar 🙂 Yours looks beautiful, perfectly golden brown. Everytime there are 1 or 2 overriped bananas at home, I mash them and put them in the freezer until I get enough cups to create banana loaf. Now that you have mentioned about coconut flakes , I am really excited to incorporate it in my recipe too. Thanks! I like my bananas “perfectly” ripe, just a few brown spots. I often bake with them and add coconut oil, coconut flour even. All healthy and yummy, plus little ones like it! It looks so tender and delicious! I love the idea of adding coconut to banana bread. Yum!